Just wow! 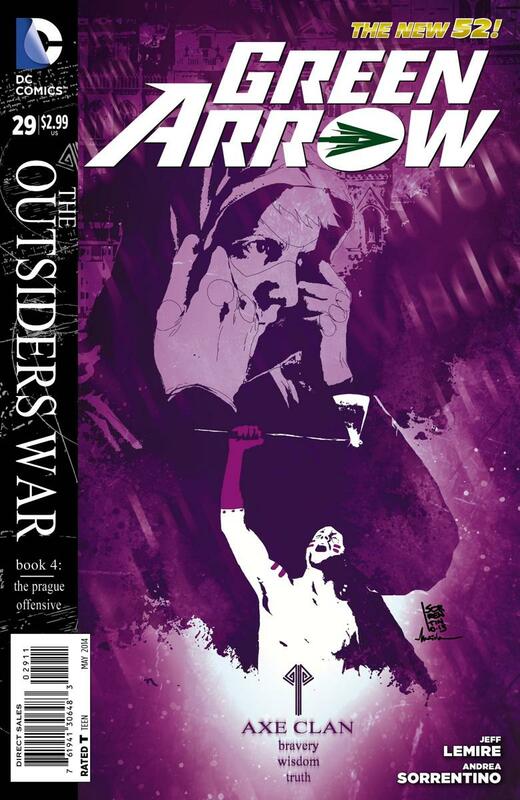 Lemire and Sorrentino are bringing us the best Green Arrow story in years with The Outsiders War. Each issue ratchets up the stake more and more. I thought when they had the big reveal with Ollie’s father at the end of issue #27, there was no way they could top themselves with a dramatic ending as that. I was dead wrong, with dead being the key word. Emiko watches from afar as her father Komodo has just taken control of the Outsiders clans. She remembers back to when she was first old enough to ask about her mother. Komodo told her that her mother Shado was murdered by Robert Queen, and while he had avenged her, Robert’s “evil” son Oliver was rising to power and must be dealt with as well. Cutting back into the present, as Komodo rallies his troops, he warns that Shado will be with Oliver, which a shocked Emiko hears. Not to far away, Oliver is making his way towards the Outsiders. He flew off the island by himself, stranding his father and Shado, as he still could not forgive the two. He tracks down the Spear clan to the docks they apparently work from. He quickly takes out the workers, only to find himself surround by the Spear clan. Using a rather nifty “umbrella arrow”, he shoots it into the sky and reigns hell down on the clan. He is able to find out where the rest of the clans and Komodo are and makes his way. Back in Star City, Diggle and the rest of Oliver’s crew are trying to find a way to take down Richard Dragon. This leads them to Billy Tockman, whom Diggle knew before he even met Oliver. Promising that when the Green Arrow is back in town he will back off Tockman, Diggle is able to form an alliance with him. At the lair of the Outsiders, Emiko confronts her father about his lies regarding her mother. He tries to distort the truth to her by saying that Shado is a very dangerous woman, and he needed to lie to protect her. Emiko seems convinced enough, and as alarms sound that Oliver has made it to them, she tells Komodo she wants to kill Oliver herself. Oliver enters very foolishly by himself and is overwhelmed immediately and captured. Komodo and Emiko enter to confront Oliver. Emiko demands Oliver tell her where Shado is, threatening him with an arrow to the head. He tries to tell her of Komodo’s lies, and that they are half siblings. This is enough to stop her from killing him, but it doesn’t stop Komodo. Komodo draws and shoots an arrow directly into Oliver’s forehead. Just wow. Obviously I don’t think our emerald archer is really dead. But he does have an arrow in his head, begging the question, how is he going to come out of this? Lemire has been bringing his A game and I am in awe. It doesn’t hurt having Sorrentino doing fantastic work to back him up. My favorite art in the book was the “umbrella” arrow. It just looks awesome and devastating as it rains down on the Spear clan. Lemire and Sorrentino can work on this book for as long as they want, which hopefully is for a real long time. This war has been fantastic so far, but even so, I do have one slight complaint. The subplot with Diggle should not be included. Oliver’s story is crushing it right now, and while it is exciting to see Diggle in the comic as a fan of the show, the scenes are very brief and add nothing to the main story. At this point I’d say it is total fan service to the show, especially dropping the Clock King in here right when he appears on the show. It would be fine if it were a separate story that was given proper support after The Outsiders War, but adding here is an unnecessary distraction. Killing your hero at the end of an issue will be a hard thing to top. I already doubted they could shock me twice, but now they really can’t do it a third time, can they? Can they??? All I know is that Green Arrow continues to be on the top of my stack and I’m going to be anxious and jittery until next month’s issue arrives. Fantastic. This week was an awesome week in comics for me. Green Arrow was great, along with the new Forever Evil and Apocalypse Al being excellent picks. Overshadowing all of them though is Velvet. I’ve raved and raved about this book, I that isn’t going to stop. With the newest issue here, the quality just keeps churning out perfection as one of the best books being written and drawn. 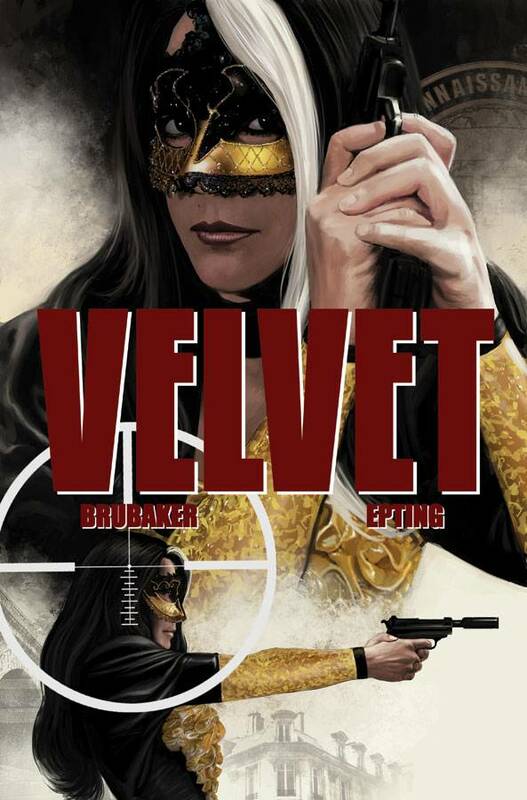 Last issue Velvet made one mistake by letting the scorned Russian general’s wife see her husband again. Killing the general and getting herself killed has created a convenient murder scene. Her old agency gets news of the murder and knows Velvet was involved somehow, giving them a starting trail. The one thing that the general’s wife was able to provide though was a tip for Velvet to follow up on, a former KGB agent who had turned to hire work, Roman, who Agent Jefferson had talked to at a party soon before he was killed. She knew he would be at the Carnival of Fools, an event the rich and powerful descend on for a night of partying underneath masquerade masks. Her friend Burke though has been spooked by the murder scene and parts ways with her, leaving her to go to the Carnival herself. Once there she is able to deduce Roman’s location and find him playing baccarat at the most expensive casino. She sees though that she is not alone in looking for him. She is able to pick out what she believes to be three Russian assassins watching and waiting for Roman to leave. As Roman leaves, the three assassins follow, along with Velvet quietly behind. The three corner Roman and attack him, telling him they are bringing him back to Russia. Velvet is able to sneak up on them and attack in what turns into a fairly brutal fight, brutal to the assassins that is. Roman pulls a gun on her, but she convinces him that she’s a friend and that they need to leave together before the police arrive. The two had actually met before and reminisce about the old days. Roman then finally tells her what he knew of Jefferson. He doesn’t know much, but what he reveals does shock Velvet. Apparently her former husband is somehow involved. The spy tale has kept at a consistent tone in each issue. The pacing could not have been made better. Brubaker gives you plenty of espionage and intrigue along with his fantastic dialogue. Then when the action scenes do come, which they seem to drop once an issue, Epting does a fantastic job to show the grace and skill of Velvet as she takes down whomever gets in her way, in whatever way she needs to. Epting handles the action in the panels masterfully, all while ensuring the quality level never drops. Velvet is amazing; there is no other way to put it. This should be on everyone’s pull list. If you are a fan of Brubaker and Epting’s work on Captain America or like a good spy tale such as Bond, this book should be heaven for you. Now let me get back to rereading this issue, it’s that good.